A healthy, hygienic environment is essential for any location, but in hospitals and healthcare settings it is particularly important. People attending outpatients’ clinics or visiting loved ones rightly expect to see scrupulously clean floors, so facilities managers need to ensure that their floor cleaning regimes, and machines, are delivering the highest possible standards. Health and safety has become an integral part of all our lives, and this is even more relevant for busy locations such as hospitals. Flooring materials have changed considerably over recent years, with safety being one of the main catalysts for these changes. New surfaces, coatings and materials have emerged to offer added benefits and reduce the risk of slips, trips and falls – essential for healthcare settings. But installing the best safety flooring for healthcare settings is only the first step – how you are going to clean and care for your floor in the years to come is just as, if not more, important. The correct cleaning and maintenance of flooring not only prolongs its life – saving you time and money in the long run – it also helps to ensure that the flooring is performing at its best. Horsham Hospital is a two-ward, 50-bedded community hospital, owned by West Sussex Health, and it has seen an increase in the use of safety flooring over recent years. 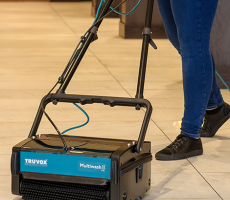 Truvox were invited to demonstrate the capabilities of their Multiwash machine, alongside a machine from another, well-known cleaning industry name. The Multiwash was selected because Horsham Hospital felt that it offered better value for money, with superior handling and reach. The Multiwash is a multi-purpose floor cleaning machine that washes, mops, scrubs and dries on both hard and soft floor coverings in one single pass. Quiet in operation, with excellent manoeuvrability, it is perfect for hospitals, nursing homes and other healthcare settings. The Multiwash is highly effective on ‘difficult’ floors, including non-slip safety floors, low pile carpets, tiles and escalators. There are four models to choose from: the MW240 and MW340 are ideal for smaller areas of hard floor; while the MW340P and MW440P offer even greater productivity thanks to their additional four-litre solution tanks and pump sprays, allowing larger areas of both hard floor and carpets to be cleaned. Thanks to its contra-rotating brushes the Multiwash exerts just the right amount of extra pressure needed to tackle grime in the grouting of tiled floors, as the bristles safely dig deep into porous tiles and grout lines, loosening and removing soils. As the brushes are so effective, it uses about 30 percent less water - which means less chemical - making it easy on the environment and the user. In addition, using less water means floors are dry in minutes, making the machine perfect for busy facilities like Horsham Hospital.